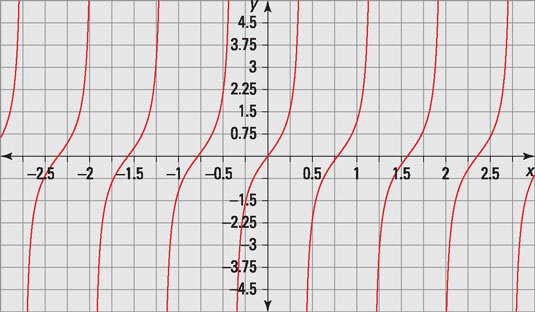 The graphs of trigonometric functions are usually easily recognizable — after you become familiar with the basic graph for each function and the possibilities for transformations of the basic graphs. Trig functions are periodic. That is, they repeat the same function values over and over, so their graphs repeat the same curve over and over. The trick is to recognize how often this curve repeats and where one of the basic graphs starts for a particular function. An interesting feature of four of the trig functions is that they have asymptotes — those not-really-there lines used as guides to the shape of a curve. The sine and cosine functions don’t have asymptotes, because their domains are all real numbers. 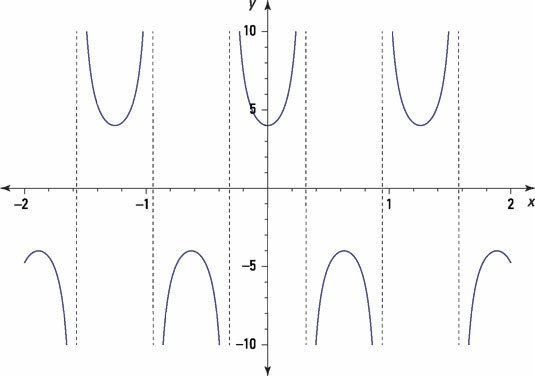 The other four functions have vertical asymptotes to mark where their domains have gaps. The given function is f(x) = tan(4x). The multiplier 4 brings the upper curves down to 4 and the lower curves up to ‒4.